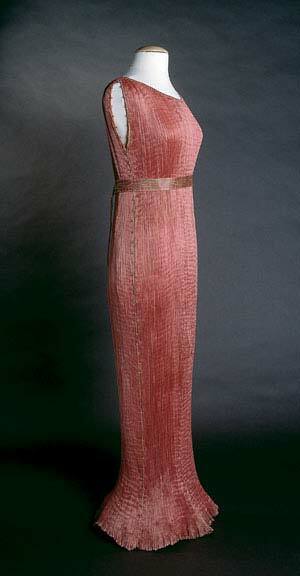 This dress is made of finely pleated rose-colored silk with silk cording along side seams, and multicolored glass beads threaded through the cording. Named after a Greek classical sculpture, the Delphos Gown was a simple column of vertical pleats permanently set in silk by a process never successfully duplicated. Avant-garde American dancers Isadora Duncan and Ruth St. Denis wore Fortunys because of their interest in the body and movement. Originally made to be worn as tea gowns for entertaining at home, the gowns were seen outside the home by the 1930s.